Shop till you run out of money! 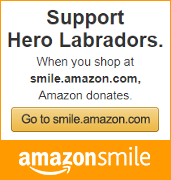 Till midnight PST, Shop at amazon smile and 10% of your purchase goes to Hero Labradors! Four AM. The sound nobody with a dog wants to hear. The sound of vomit hitting the rug by the bed. Ugh. Wake up. Slide out of bed. Take two steps. Find puke with toes. Gag. Hobble into bathroom. Wash foot in tub. Stumble upstairs. See little footprints everywhere on wood and tile floors. Pantry. Somebody decided a bottle of cooking oil would make a good late night snack. Empty mop bucket, spray out mop. 5 AM. Wrangle dogs. (Halia sleeps with me, uncrated. Nani is crated in son's room. Tonto in daughter's. Polar Bear is in his crate in the dining room. Uncrate and lead outside. Dogs do what we all do in the morning, that is, stare stupidly at me until I tell them to go potty. Back to the kitchen. Floor is dry (mostly) but pantry needs another dusting of soda. Grout soaked up a bunch of oil. Get food ready for dogs, who are intently staring at me through the patio door. Place bowls on my side of door. Walk away. Get coffee. Feed dogs. Everybody sits first, bowls placed in front of them, they wait, drooling. They wait. I hold them a minute, then tell them "recover." They dig in. Back to pantry. Eh... I'll wait and vacuum/mop later. Need more coffee.